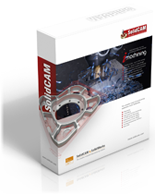 SolidCAM is the best solution for manufacturing inside of SolidWorks®. The most successful manufacturing companies today are using integrated CAD/CAM systems to reduce costs and get products to market faster. In the past, integrated CAD/CAM solutions were so expensive that only Fortune 500 companies could afford them. Integrated CAD/CAM solutions were also difficult to learn and use, so a company needed degreed engineers to tackle the complexities. SolidCAM has broken that tradition by providing an easy to use, powerful pairing of applications that has a low investment and a short ROI. SolidCAM is the fastest growing CAM application in the world, and has been for several years. It is completely integrated inside today’s leading CAD solutions. All machining strategies are defined without ever leaving the CAD environment. There is no loss of data or other problems with translation that plague stand alone CAM systems. Because SolidCAM is truly associative, changes to the design are automatically updated through to the tool path. SolidCAM is proven technology from a company that has been in the business for 28 years. iMachining is a true breakthrough in CNC Milling Tool path technology that enables cutting 2 to 3 times faster and deeper by optimizing tool cutting angles and feed through the entire tool path. You can use your existing CNC milling machines to run faster and deeper, with even the smallest cutting tools in the hardest materials. Seeing is believing, as iMachining shows all users how it can save up to 70% of machining time, dramatically extend tool life and simplify CAM programming, all in real-time, live cutting demonstrations. Unlike other CAM systems that leave users guessing at CNC machining parameters like Speeds and Feeds, iMachining uses a patented “Technology Wizard” that expertly guides users through all steps to optimize the production job. With the Wizard, iMachining uses the tool data, together with geometry, material and CNC machine properties, to generate smooth morphing spiral toolpaths which ensure constant cutting force on the tool. The calculated CNC-programs avoid continuous repositioning and time-consuming air cutting movements like insertion, retraction and withdrawing. The results are significantly higher metal removal rates and also reduced load and wear on the tools and CNC machines. Users enjoy shorter cutting-times for increased CNC machine productivity, longer tool life, better machining process, reduced CNC machine wear and the best surface machining quality. See iMachining in Action — Watch the Video! Anderson Industries cut weeks off its turnaround time and increased its margins by integrating SolidCAM into its existing design-to-manufacturing process. Master Machine realizes ‘huge time savings’ after switching from GibbsCAM to SolidCAM. If you’re interested in viewing a software demonstration of SolidCAM, please contact our sales team. Applied Engineering is happy to schedule a face-to-face or web demonstration at a time that is convenient for you. Contact Applied Engineering if you’re interested in purchasing SolidCAM. An Applied Engineering technology sales consultant can normally deliver a quote to you within hours. Applied Engineering is authorized to sell SolidCAM products through its offices in Minnesota, North Dakota, South Dakota, Wisconsin and Northern Iowa. If you’re looking for more information about SolidCAM, you can download an overview or features brochure.